We have to establish the dependency between the tasks, if the tasks are dependent upon each other. When you link tasks in Project, the default link type is finish-to-start. This link specifies predecessor task must finish before the successor task begin. Start-to-Finish: Successor task can finish only after the predecessor task has started. Finish-to-Finish: Two tasks must finish at same time. This type of link is rarely used. Here, I am establishing the Finish-to-Start dependency for the task �Create project using Project Office criteria/templates�. Click the first blank row in the Task Name field, and click the dropdown. The list of all the tasks in the project plan appears. A task that must occur before another task is �Predecessor task�. The task that occurs later in the relationship is a �Successor task�. External dependency may not be identified in earlier stage of schedule creations. As the project execution progress, an inter project dependency with your project may arise. I have a task called �Create deployment script� on MS Project Server Deployment. I want to link this task to another task in the project MS Project Client Deployment. 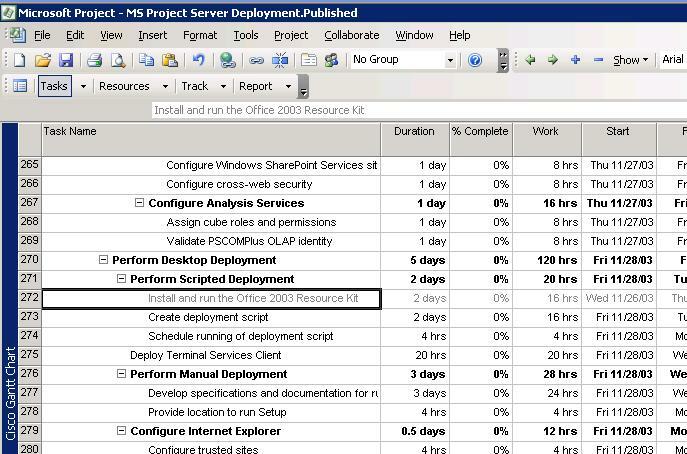 The task in the MS Client Deployment is called �Install and run the Office 2003 Resource Kit�. The task �Create deployment script� should start after finishing the task �Install and run the Office 2003 Resource Kit�. Here we are defining the Finish-Start dependency between the tasks from two different projects. 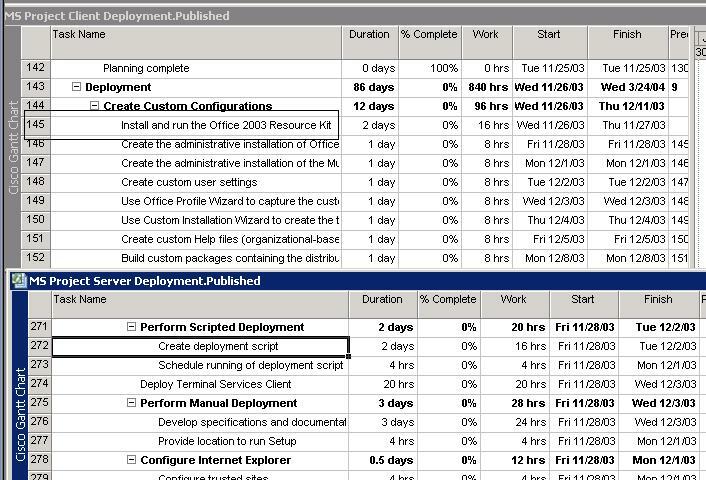 Double click on �Create deployment script� on MS Project Server Deployment; you will see the Task Information window. 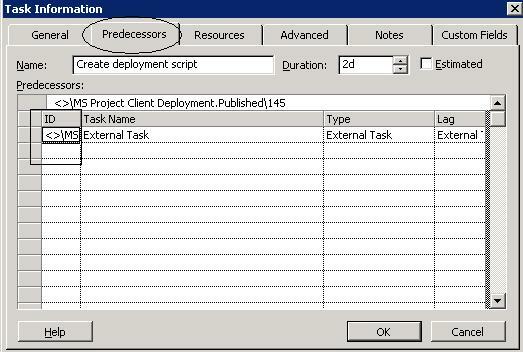 Note: Create deployment script will be the successor task for task on the MS Project Client Deployment. If you�re linking the tasks between two enterprise projects, the projects must both be the sane enterprise version. In this example, both the projects are �Published� version. If you�re linking the tasks between two projects on non-enterprise (desktop) environment, please use the complete path of the project name for specifying the ID for Predecessor. External tasks are highlighted in gray in task sheets (Gantt/Task Usage views). If you double click on external task, the project containing that task opens, and the task is selected. You can review the external task information and current schedule. 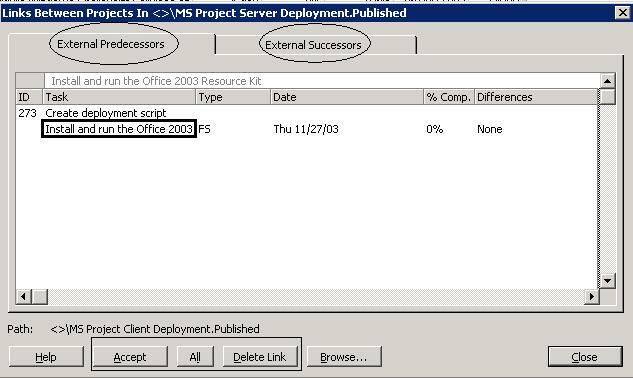 In this example, �MS Project Client Deployment� project will open and �Install and run the Office 2003 Resource Kit� task will be selected for review. By closing this project, you can return to previous project. 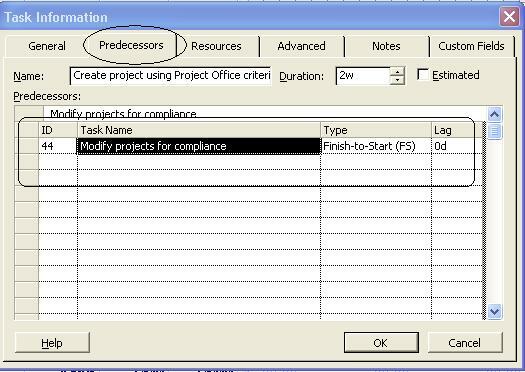 The Links Between Projects dialog box shows entire information about all External Predessors tasks and External Successors tasks in the project plan. The above window will display the path of the external/predecessors along with their link types (In this example, FS -> Finish to Start); Current percent complete, and any updates. If the external task has been modified, in that case �Differences� will display the variance between current plan and external plan. If you see the any differences, you have option to accept the changes from external project. You have to click �Accept� button to incorporate those changes into your project plan.